We’d love your help. Let us know what’s wrong with this preview of Hidden Fire by Deirdra Eden. Auriella’s new life as a royal protector is in shambles. The new king ignores her warnings of a Shadow Legion invasion and he is determined to marry her off. Ghosts from her past, the discovery of other Watchers, and a handsome Scottish warrior throw her off guard and weaken her emotional defenses. Caught in a web of secrecy and betrayal, Auriella struggles to control and Auriella’s new life as a royal protector is in shambles. The new king ignores her warnings of a Shadow Legion invasion and he is determined to marry her off. Ghosts from her past, the discovery of other Watchers, and a handsome Scottish warrior throw her off guard and weaken her emotional defenses. Caught in a web of secrecy and betrayal, Auriella struggles to control and protect the devastating power of Starfire. A terrible truth and a fateful choice will lead her to her destiny as the fabled Lady of Neviah, or could shroud the entire world in eternal darkness. To ask other readers questions about Hidden Fire, please sign up. Once again I am swept away into the world Deirdra has created. I think I enjoyed this book just as much as the first. Hidden fire takes place a few years after night of light. Auriella is working away at keeping the people of England safe from the shadow legion. Even though her work is unappreciated and often the joke of the town she keeps her promise as the countries Watcher until she is forced into a mission that changes her whole perspective of what she needs to do to save not only the people Once again I am swept away into the world Deirdra has created. I think I enjoyed this book just as much as the first. Hidden fire takes place a few years after night of light. Auriella is working away at keeping the people of England safe from the shadow legion. Even though her work is unappreciated and often the joke of the town she keeps her promise as the countries Watcher until she is forced into a mission that changes her whole perspective of what she needs to do to save not only the people of England but the whole human race. On her travels Auriella meets some new neviahan companions, Orion an earth wielding neviahan, Korban with his ability to wield any weapon and the breath taking Azrael and his loveable but fierce tiger Baby. Can their combined strength be enough to defeat The terrifying shadow legion leader or will they need something more. I love the new characters, Deirdra has done another fantastic job at creating characters you will love, some you will hate and some that have been brought back to stir up all sorts of emotions in Auriella. I absolutely loved this book! I think I loved it more than the first one actually. This book is filled with unexpected plot twists, a beautiful romance, and and so much other thrilling things that I couldn't put it down! I would definitely read this again and again and strongly suggest it for other people to read! This book was absolutely amazing. I thought that I knew what was going to happen pretty near the beginning, but I was pleasantly surprised. And it didn't detract from the story as much as you would have thought. So many wonderful quotes in this book and I can't wait to visit the book again and glean more of them. I loved this book even more than the first. I received an ebook to review. The second book in the Watchers series, this continuation of Lady Aureilla's adventures was just as enjoyable as the first book in this series. Follow Aureilla as she is at first mocked by her new king, who thinks she has been inventing her stories of the Shadow Legion trying to take over the throne. Then, she is reunited with her first love, Lucas, who has become the King's new captain. Lucas also seems to think that Aureilla is just fancying herself a mythical warrior of legend. Aureilla is se The second book in the Watchers series, this continuation of Lady Aureilla's adventures was just as enjoyable as the first book in this series. Aureilla is sent on a mission to parlay with the Scottish King, and on her way is attacked by the Shadow Legions. She is able to take out most of the attackers on her own, but is rescued and later awakens to find that she is now surrounded by some Neviahan's who also happen to be Immortals. Aureilla, of course, doesn't figure this out until later, but what she does discover is that one of her rescuers, Azreal, happens to be her one true love from before her mortal existence in Neviah. Azreal also happens to be the key to unlocking Aureilla's secret power, Star Fire. Aureilla is torn between the love she had for Azreal in their previous existence and the love she has just been reunited with back in London, Lucas. These complications are just a part of Aureilla's concerns, she still has the Shadow Legion to deal with. All of their current information points to the same conclusion, the leader of the Shadow Legion has taken up residence in London, and has already usurped a position in the capital to influence the King. They must return to save London so that the Shadow legion does not reek more havoc throughout the world. Just as it seems the battle might be won, however, Auriella is transported back to Neviah. She is shown her path and given the choice to stay in Neviah or return to earth and finish the battle. The rest is spoiler alert. I found this book to be exciting and there are some lighthearted fun elements thrown in amidst all of the danger and the drama of the newly formed love triangle in this book. The author does a good job getting you to empathize with Aureilla's character and hope that all ends well for the love crossed beings who's purpose is to destroy a dark empire that will not rest until they have conquered earth. All in all, this book was very entertaining and leaves you wanting to find out what's in store in the next book of the series. Overall, Hidden Fire was an exciting read with a fully developed plot, a worthy successor to book 1. I had no trouble picking up the thread of the story without feeling dragged down by backstory. Lady Auriella is England’s unappreciated watcher, getting into trouble for causing damage via her fiery battles. This time, the writing pulled me into her head better because others described her rather than breaking her point of view. A nice improvement. The characters were great. I couldn’t help but lo Overall, Hidden Fire was an exciting read with a fully developed plot, a worthy successor to book 1. I had no trouble picking up the thread of the story without feeling dragged down by backstory. Lady Auriella is England’s unappreciated watcher, getting into trouble for causing damage via her fiery battles. This time, the writing pulled me into her head better because others described her rather than breaking her point of view. A nice improvement. The characters were great. I couldn’t help but love the male Scottish trio and Baby. You’ll just have to meet these guys to realize there’s not much contest between old and new loves except in Auriella’s imagination. That very predictability was my biggest hindrance to complete enjoyment though, especially because I recognized the real bad guy long before the denouement. However, meetings with old friends I loved from book one mostly made up for that. Of course, as an editor, I notice problems others might not. The repetitive sentence structure often pulled me out of the story. At one point, I even started counting sentences between opening clauses. Yet I think there was more variation than in book 1, and I hope book 3 will continue the trend. Editing was uneven, but compared to fast pacing, this was a minor irritation. If you like romance mixed with plenty of action and adventure with some mystery, this series is for you. If you dislike incomplete story arcs, this series is for you. Both books went far enough to complete a story, and this one even began the next. The final destination made a great reward in spite of the sad circumstances. The pictures came from the author to me in everlasting color. Bottom line: if you love cinematic books packed with fully developed characters, you have to read this book. 4 of 5 stars. I would have no qualms with tweens reading. I received a free copy in exchange for an honest review. 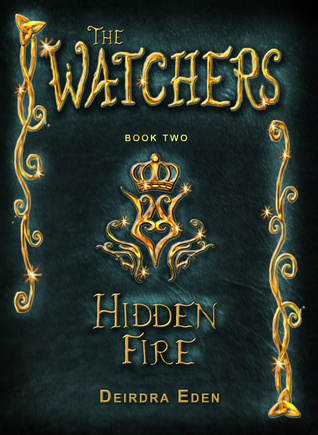 This is the second book of the series The watchers from author Dierdra Eden. This is a semi short book at a little over 200 pages on my reader. Currently it is available in e-book and paperback. This book is written much like the first book. It does a great job of keeping your interest through out the story. The story adds a few new characters to the story line. For the most part they are not developed well, barely enough to understand their purpose. The development of Auriella further expands in This is the second book of the series The watchers from author Dierdra Eden. This is a semi short book at a little over 200 pages on my reader. Currently it is available in e-book and paperback. This book is written much like the first book. It does a great job of keeping your interest through out the story. The story adds a few new characters to the story line. For the most part they are not developed well, barely enough to understand their purpose. The development of Auriella further expands in this second book, still leaving some things to be found out in the continuing series. The book could be read as a stand alone but it would leave many unanswered questions about the plot. It is a much better read if you read the first book of the series. This book is geared more for teens and young adults. Although I do not fit in the teen or young adult age group I did enjoy the book and think it is a good continuation of the series. I look forward to the next part of the story. If you are looking for a good series of books to read from fanstasy, sci-fi genre this is one series you should consider reading. I would like to thank Netherfield Publishing and affiliates for sending me this book to read and share my opinion. I didn't get a chance to read book one yet, but after the wonderful adventure in book two, I'm definitely going to correct this. Still, even without book one, I had no trouble diving into Auriella's story. Auriella is a great character, a strong girl who's stuck in a time and class where women were supposed to be anything but amazing warriors. It was easy to get involved in her troubles and understand why she felt the way she did about things. She's not always sure of herself, but it's exactly th I didn't get a chance to read book one yet, but after the wonderful adventure in book two, I'm definitely going to correct this. Still, even without book one, I had no trouble diving into Auriella's story. Auriella is a great character, a strong girl who's stuck in a time and class where women were supposed to be anything but amazing warriors. It was easy to get involved in her troubles and understand why she felt the way she did about things. She's not always sure of herself, but it's exactly this doubt which makes her so enjoyable to cheer for--because she is amazing. The plot itself moved along, not leaving any moments where I wanted to put the book down. The main character faces tons of dangers, must fulfill seemingly impossible tasks, and, of course, if she fails, it will ruin all of mankind. There were enough twists and turns to keep me turning the pages, and even when some outcomes weren't a total surprise, I enjoyed seeing where the story went. Plus, there's a nice level of tension, especially in the romantic end. Summed up, this was a fun and exciting read which meets all the criteria an adventure should. I can only recommend it to YA Fantasy/Paranormal fans and can't wait to dive into the rest of the series. Our knighted Auriella is now in charge of protecting England from the Shadow Legion. The story starts off with a battle between Auriella and a Shadow Lord right from the start and the excitement continues till the last page. The second book of The Watcher's series is fast paced and really fills in many of the gaps from the first book and our heroine learns more about herself, powers, and where she is from. She discovers more of her powers with the help form a very interesting person that leads to a blossoming romance. This is the second book I have read in the Watchers series, and definitely my favourite. It has been six years since we were first introduced to Aurellia, an orphan with brilliant powers and secrets even unbeknown to her. She has come a long way in that time, and has now been given the job by the King to protect England against attacks by the Shadow Legion. She is ridiculed for her position, as she "will never attract a husband wearing a sword". She is sent on a mission to kill the King of Scotl This is the second book I have read in the Watchers series, and definitely my favourite. It has been six years since we were first introduced to Aurellia, an orphan with brilliant powers and secrets even unbeknown to her. She has come a long way in that time, and has now been given the job by the King to protect England against attacks by the Shadow Legion. She is ridiculed for her position, as she "will never attract a husband wearing a sword". She is sent on a mission to kill the King of Scotland and is hurtled into a journey of danger from enemies of her past. She discovers a new power, and a kindred spirt in Azrael, a fighting partner from her past, who provides a worthy love interest. Aurellia is a strong character who shows much courage, and is dedicated to ending the war of light against darkness. Along the way, secrets are revealed, much blood is shed, and Aurellia is forced to choose between an old face from her past, and the man she meets while on her quest. This book had me even more engaged than the first. The second book was geared a little more for adults even though the heroine is a 19 year old. It was hard for me to put the book down once I started reading it. Auriella is still fighting the Shadow Lords who are after her blood and ultimately her power. Not only is she discovering more about herself, she is trying to gain acknowledgement and respect shown mainly to men. She is still working through the loss of her fiance years prior and has no d This book had me even more engaged than the first. The second book was geared a little more for adults even though the heroine is a 19 year old. It was hard for me to put the book down once I started reading it. Auriella is still fighting the Shadow Lords who are after her blood and ultimately her power. Not only is she discovering more about herself, she is trying to gain acknowledgement and respect shown mainly to men. She is still working through the loss of her fiance years prior and has no desire to open herself up to suiters. Even through all of the action, threats, tension and drama, there are still many moments of humor throughout the story. I was continuously intrigued as I followed Auriella discover that she was capable of an even greater power by merging her energy and power with a complimentary set of powers found in one of her own people. King Edward sends Auriella on a mission to Scotland, against her better judgment she leaves. Along the way she meets three Nevian rebels. One wields the gift of nature, one the gift of weapons and th I received a free copy of this novel in exchange for my honest review. Her journey is fraught with danger - not just from the Shadow Legions and ghosts from the past, but from the strange Watchers she meets on the road and the one handsome Scottish At 19, Lady Auriella is the Watcher of England and she's beginning to feel like a miserable failure. The newly-crowned King Edward doesn't believe in the Shadows and publicly mocks her position whilst trying to find her a suitable husband. Her world falls further apart when she's sent to assassinate the King of Scotland. I received a free digital copy of this book for the purposes of an honest review. The minute I received this ebook, I was reading, and I spent the entire day on my Kindle. My family could all see to leave me alone, ha ha! One of my I received a free digital copy of this book for the purposes of an honest review. Well, I am glad I gave this series another change. I was not a fan of book 1 but book 2 was definitely better! I felt that this book was still predictable and did not flow as well as it could, but the characters were better developed and the book was more engaging. I am definitely intrigued to see how the rest of the story goes. Now that we are gaining more background information on the main character, I feel that I c Disclosure: I received a free copy of this book in exchange for an honest review. Now that we are gaining more background information on the main character, I feel that I can connect with her better and that I am able to engage better with the book. This book is a fantastic follow-up to the first. The writing is flushed out a lot more and Eden's ability to enthrall with her writing style and use of visual wording makes for an excellent read and a unique story. I hope to read many more of her books in the future. This got me back in the habit of just curling up with a good book instead of browsing TV shows. This a great continuation of the story of Auriella who is now a royal protector from the shadow legion. Book two has lots of twists and turns in store for you to read about. Their was times of humor mixed with times of danger and excitement i was wrapped up in the story from the first page right up to the end. When I didn't think it could get any better, this one beat the awesomeness of the first book. I admit it made me a bad mother, I had to keep reading and my kids watched way to much T.V. I loved it, the romance, the suspense and the epic battles were super fantastic! Deirdra I can''t wait for book #3! I was so engrossed in this story and it took me only 4 days to read both books! I love the fact that the protagonist is a female and a relatable one at that! Definitely looking forward to a third installment! Great job, Deirdra Eden! This book is definitely a page turner! With amazing characters, very captivating plot and many mysteries yet to uncover Hidden Fire will leave hanging to the very last page, cant wait to read the third part! Even better than the first! I absolutely LOVE the new characters in this book, they are so fun. And the romance? Wow, sparks-a-flyin! Her goal in writing is to saturate her books with intrigue, mystery, romance, and plot twists that wil Deirdra has spent the last decade captivating audiences of all ages with her novels and fairy tales. Her specialty is paranormal theology that delves into documented historical phenomenon and natural disasters of biblical proportions that entices indulgence of a fine line between fact and fantasy.